I remember I used to play around 3 years ago. More than once I found myself unable to join a game (real time) because it filled up while I was reading the map options. Games filled up quick and there were many while now I check multiplayer and I see the same games still struggling to round up enough players. It could be level requirements... I commonly use a level req of 20+ on most of my games, and you wouldn't see the games that are being filled up. Auto games fill up as fast as ever, tbh. The answer is simply what was said before, and also simply that Warlight doesn't have the large dedicated group of people as it used to, but rather mostly people who show up from time to time for some games. Multi day games seem to be much more common than real time (although a lot of it is diplomacy) but I think if anything there's even more games than usual, just not the same kinds of games as it was from a few years ago. That said, in terms of new account creation (going by ID's, since they increment) it doesn't look like a big slowdown has happened. Maybe it's just seasonal. Interesting graph. What happened with that huge overnight spike for warlight? don't think there has been that big of a drop in number of players, would be nice if Fizzer had some usage stats for us though. regarding the spike and the suggestion to push unity version to kongregate: that site isn't as hip as it was back then. 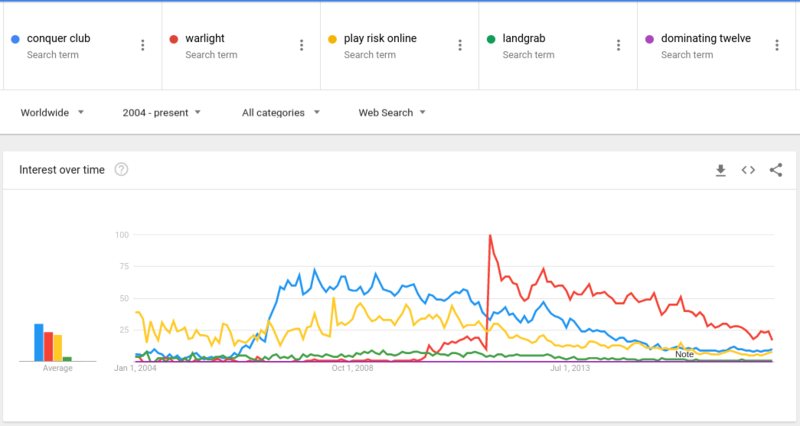 i think warlight could really use some exposure from being present in other platforms though, like gog, itch.io and steam. but Fizzer doesn't feel warlight is a good fit for steam.